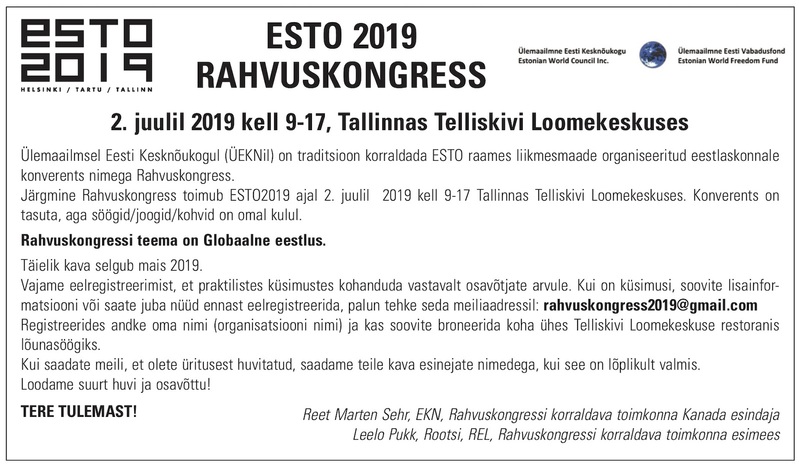 Tere tulemast Eesti Vabariigi saja esimesele aastapäevale! 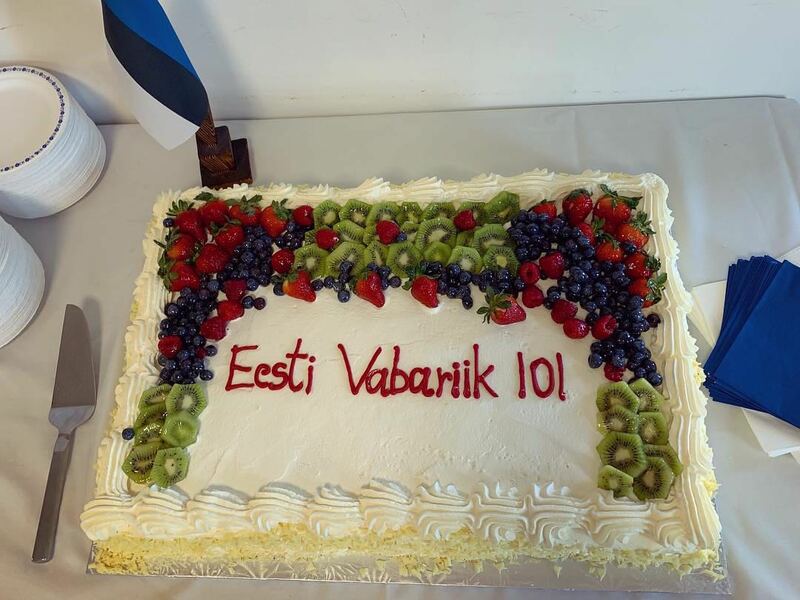 Welcome to the 101st celebration of Estonian Independence! Vabariigi aastapäev, Sunday February 24th 2019. Many attendees participated in the church service, led by Õpetaja Andres Rebane. Folks moved from the kirik to the saal and found it to be decorated with Estonian flags, balloons in our traditional sinimustvalge, and tables laid out ready for the guests to enjoy the various foodstuffs provided. Guests were also treated to a showing of the video greeting from President Kersti Kaljulaid, all while enjoying võileivad ja pirukad. The vocal stylings of ensemble Müra were an added treat during the lunch! With guests’ palates satiated, it was time for the aktus, which this year took place in the kirik. The traditional flag procession was performed along with the singing of “Oh Canada.” Opening remarks / avasõnad were delivered by Eesti Seltsi Esimees Thomas Pajur. He welcomed everyone to the celebration and also spoke of this day as the turning point for all Estonians, where they renewed hope in the face of losing so many compatriots to war. 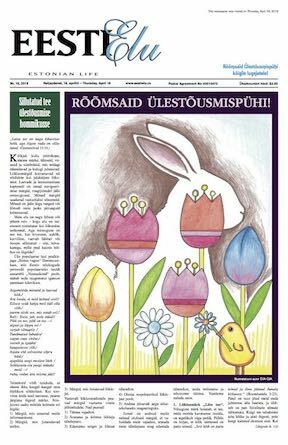 He was encouraged by the good showing of people in attendance, approximately 80 in total, which demonstrated that the Estonian spirit was alive and well. The palvus, delivered by Õpetaja Andres Rebane, followed opening remarks. He gave blessings for the day and for all our organizations, and hoped that everyone can work well together in the coming year. Thomas Kirves on the klaver accompanied the singing of “Puhake, paremad pojad.” This tugged at the heartstrings of all in attendance, given its meaning and historical reference. 1. It is the first time that the Premier's annual letter had referred to British Columbia and Estonia “as friends and partners on the international stage.” He is particularly proud that Estonia has grown so much in the eyes of the world since re-independence, and that many countries and provinces now truly recognize their relationship with Estonia as one between friends and partners. 2. It was also the first time that a sitting Minister of the Government of British Columbia has visited Estonia for business reasons while in office. In August 2018, Bruce Ralston, Minister of Jobs, Trade and Technology, visited Tallinn to learn about e-Estonia and how BC and Estonia can collaborate with respect to the further development of our digital societies. Minister Ralston requested that Estonia present its e-governance story at the BC Technology Summit at the Vancouver Convention Centre next month, and Andre Krull of NORTAL will be coming to represent Estonia at this Summit, the largest annual technology summit in western Canada. Singing was next on the agenda. Women’s Vocal Ensemble Leelo performed three songs, and were accompanied by Aarne Tork on guitar. This year it was decided to skip the traditional guest speaker and hear from all the various groups in our community. Thomas Pajur had spoken earlier on behalf of Eesti Selts. Olev Rumm gave greetings from Church Foundation / Kirikufond, and spoke about our community and the need to make more use of the building and its various rooms. Mari Kaul-Rahiman delivered greetings from the Church Council / Kirikunõukogu. Her mission is to turn around the declining membership and church attendance. It is only with increased membership and participation that we can carry on. Enno Paat gave greetings from the Orthodox congregation, and spoke about the history of the church, including the first Minister that the church had. For a change of pace a poem was read by Silvia Soide, written by Hedy Wister. Silvia also relayed her thoughts on being part of the Estonian community here and in Kihnu. She was happy to be not only part of the community but be immersed in it and living it every day. She appreciated the culture while living in Eesti, and embraced the different way of living. Thomas Pajur also relayed greetings from the Vancouver Latvian community, and the President of the Vancouver Lithuanian Society was in attendance, and also gave a speech. Closing remarks also by Thomas Pajur reminded people to attend the upcoming Maipidu, Jaanipäev celebration, and the various talgud for the Mäeotsa property — the latter especially would be much appreciated. The mixed choir Läänetuul (conductor Thomas Kirves) closed out the performance component of the program with three songs. It was lovely to see and hear the Estonian voice lifted up in song, a strong showing for the choir. All stood for the singing of the Eesti Vabariigi hümn and lippude välja viimine. Thank you to all who attended and who were part of the organization of the event. Suur Aitäh!! !